The <iron-collapse> elements are used to collapse a content. 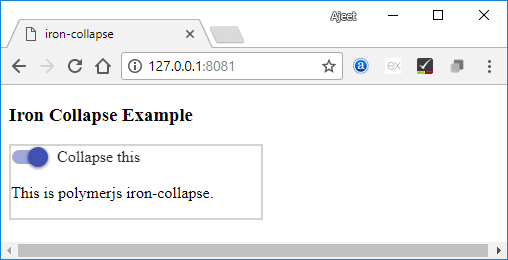 You can use opened or toggle() with <iron-collapse> element to show or hide the content. The max-height/max-width of the collapsible element is automatically adjusted by the iron-collapse element. You can use custom properties and mixins for styling <iron-collapse> element. --iron-collapse-transition-duration: It specifies the duration of animation transition. Its default value is 300ms. Open command prompt and use the following commands to navigate to your project folder and implement iron-collapse element. 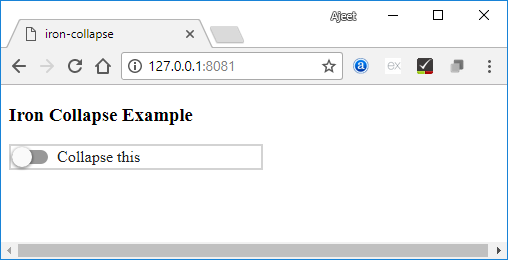 This command will install both the elements in bower_components folder and then you can import both files in your index page.